The Queen and the Duke of Edinburgh, together with other members of the Royal Family, gave a State Banquet in honor of the President of the Republic of Korea at Buckingham Palace. Unless you count the State Opening of Parliament, this is the first tiara event of the year for Her Maj, and more than likely the only one we'll see. So you have to love that she's busted out one of her biggest brooches (and a rare sight, at that), plus a hefty necklace and earring set - none of which we've covered on the blog before. She's done her best to tide us over, because she's a gem. 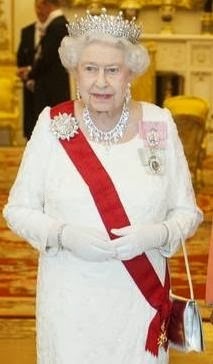 She upped the sparkle factor but kept it all in white, which allowed the red of her Korean order to really stand out. I'm not sure just yet which bracelet she's worn, so if you have any thoughts, chime in! There wasn't much in the way of other British tiaras on display, only a mere glimpse of the Princess Royal. Once again, bonus points are awarded to the President, who shined in her traditional dress. Click here for a gallery. You can also see the Duchess of Gloucester, also in attendance, but alas we still can't really see the tiaras for her or for the Princess Royal. There is also a traditional banquet for the visiting head of state at the Guildhall, which was attended by the Gloucesters. And here we actually can see the Duchess well enough to tell that she's worn her favorite Gloucester Honeysuckle Tiara, in its all-diamond format.